Click back to Honest John’s Motoring Agony Column 24-12-2016 Part 1. I first got to know the Toyota Hilux Surf model when working in Tanzania. They seem to be ubiquitous on Africa's difficult roads. I liked my African Surf so much that ever since I have imported models direct from Japanese websites to England. My current model dates back 19 years, brought over four years ago. (It cost about $9,000, including shipping, etc.) According to the MoT mechanic, it is in excellent condition (I know nothing whatever about cars, so rely on people who do). Is it reasonable to hope for it to carry on reliably for another ten years, by which time I hope there will be a tried and tested plug-in hybrid version of the Surf, or something like it, with a high driving position? Another thought is should I be worried about the aging airbags? Or leave well alone and hope not to be in an accident ? Anything else to be careful about ? Leave the airbags alone. Cost more then the car is worth to replace them. This has a timing belt engine so the timing belt, waterpump and tensioner need to be replaced every 4 years or 40k miles whichever comes first. It's the big complaint about Toyota HiLux pick-ups and HiLux based Fortuners in Thailand. Isuzus, Mitsubishis, Fords and Mazdas mostly have everlasting chains. In the advice page on 3 December, the owner of a 2001 VW Golf 1.6SE with 150,000 miles on the clock was told "you might as well keep running it until it expires or is no longer economical to repair". Then, a few letters further on, the owner of a 15 year old Audi A3 1.6 with only 86,000 miles on the clock who asked about changing the (original) spark plugs and the cam belt (last changed at 46,000 miles) was advised yes, to change the plugs, but "unfortunately the cost of belt, tensioner and water pump is likely to be more than £500". Does that mean that £500 is your definition of "no longer economical to repair"? I ask because in 2011 I inherited a 2002 Peugeot 206 HDi (in the family from new), which should turn 100,000 miles in the next month or two. It had the new belt/pump set in mid 2009 at 47,000 miles, which is making me think about a further replacement, at about £500. Most years the car costs me a spring service/MOT and a pre-winter check - say, £280, plus road tax. This year has been more expensive and will come in nearer £650 (something went clank-crunch in the engine, resulting in a low-loader ride, and one front suspension arm needs replacing pre-MOT, thanks to a close encounter with modern road maintenance standards). But while my garage can keep it on the road at that cost, why would I think of spending at least 10 times that for a second hand replacement of unknown provenance/reliability, or more twice as much for a new car, especially when neither option is likely to be as much fun to drive? If it expires utterly, that will have to be the end, but until then my definition of "economical to repair" will stay at about twice your estimate. No. Simply warning the Audi owner what this maintenance job was likely to cost. There's a difference between maintaining a car and having to repair or replaced a broken component when the car breaks down. And, of course, an 86k mile A3 is worth a fair bit more than a 150k Golf or your 2002 Peugeot 206. Your problem is you've spent £650 on it already and that's already more than the car is worth. So if you can stomach the risk, my advice would be the same as to the Golf owner: carry on running with minimum necessary maintenance until the car expires. Then replace it with something newer that need not cost anything like 10x £650. I have just received a £250 Penalty Charge Notice for driving my Land Rover Defender 90 2.5 TDi on the A20 Sidcup By Pass on 30th October. Apparently my car started life as a van, but has had carpet, side windows and four seats fitted in the back before my purchase. I would value your advice on how to challenge the penalty for an alleged offence that I do not believe I committed, as the station wagon is not commercial as therefore not prohibited. You have no basis to challenge the penalty. The vehicle should have been properly re-registered for change of use as a car and hasn't been. So TFL regards it as a commercial vehicle that does not meet the LEZ requirements. This has been a problem for owners of Land Rovers classified as ‘dual purpose’ or as ‘commercial vehicles’. We are just retired and are looking to buy a new or nearly-new car. My wife with all her aches and pains would like a heated seat and back, an automatic and petrol as the minimum specification. We have a budget of approx £20k. Take a look at a Peugeot 2008 1.2 Puretech 110 EAT-6 on which heateds front seats are a £150 option. Alternatively, either a KIA Venga or a Hyundai ix20 automatic which have heated front seats in ‘3’ spec and ‘4’spec. The auto of the otherwise excellent Ford B-Max has been a bit problematic. I own a 2007 SEAT Alhambra D Stylance that I've had from new. It was a company car and I purchased it from the leasing company as I liked the car a lot. The car had always been regularly serviced and the cambelt changed as per the service schedule. But the new cambelt failed after 15,000 miles. On investigation, it was the alternator belt that shredded and a piece of the belt became tangled with the cambelt causing a destroyed engine. However SEAT offers no recommended replacement intervals for the alternator belt, so there is no obligation to change it during the service, hence the failure. Is this a know problem? My repair specialist has seen a number of this type of failure. I believe drivers need to be aware of this and ask the right questions their garage. Yes, it's a known problem with all timing belt engines where the timing belt is not completely encased. They usually aren't, except at the top to stop people inadvertently catching a sleeve in them. Belt in oil engines such as Ford's 1.0 EcoBoost and Peugeot's 1.2 PureTech are, of course, completely encased. Serious warning. In future when I suggest timing belt, waterpump and tensioner replacement I will try to remember to also recommend a new aux belt that only adds a few pounds to the total cost of the job. I have a question about the s-tronic Audi gearbox. I am thinking of buying a 2014 Audi avant 2.0TFSi Quattro that has an 's-tronic'. Our old 2012 A4 avant (stolen) had the 'Multitronic' gearbox, which we found was not great at low speeds or pulling out of a junction. It would hesitate and then lurch forward once it got more gas. On hills at junctions it would roll back. Would you know if the s-tronic box is different or goes anyway to solving this? The A4 Avant has a longitudinal engine and if it is 's-tronic' it will have the longitudinal wet clutch 7-speed s-tronic, same as the Audi A5 and Q5. This has had a few problems but is generally far more robust and reliable than the disastrous 7-speed dry-clutch 's-tronic' in smaller, transverse engined Audis. The 'Multitronic' was a CVT that was infamous for problems with its multiplate clutch. However, all VAG cars can have intermittent hesitation emerging from side roads or onto roundabouts because the brake pedal switch can stick and send a message to the ECU to reduce power. This can usually be cured by replacing the brake pedal switch. My Peugeot 207 SW Allure was first registered on 31-10-2013 and purchased by me on 12-11-2015 and covered by a warranty supplied for “a lifetime peace of mind motoring”. A fault developed in May of this year with the brake callipers sticking and, after your assistance, this was rectified by renewing the complete assembly without charge. However this morning another problem has arisen and I would value your advice once again. Returning from our weekly shop and would you believe on the way home remarking to my wife, this car drives like a ‘limo’ a journey of around 6 miles when I turned off the engine the electric fan kicked in and continued to run. It kept running for some time, eventually stopping. When re-starting the car to park it up a message showed on the display saying engine fault temperature failure. I immediately contacted the dealer who said it was up to me to get it over to their Crewe Garage at my expense. When I contacted my breakdown cover I was told I don’t have Home Start and I should have to pay £95 for the first 10 miles then £3 a mile after. (My fault there.) I managed to get a local firm to take the car in tomorrow for £55, which is a saving, so that the dealer can identify the failure. I am hoping this fault is covered by the warranty. Although the manufacturer warranty expired on 31-10-2016, would they not offer any help? The other problem is over a hire car from the garage as they say the first available car from them is the 12th of December and my wife and I are in our 80s. I think this problem is nothing more than a sticking engine coolant temperature sensor/sender. It's an inexpensive component that screws into the engine block and switches the electric radiator fan on and off between a predetermined temperature range. It should not cost more than £100 to replace and top up the coolant. If I'm right, getting the job done locally, even if you have to pay for it, makes more sense than paying a fortune to have the car transported to the dealer who sold it to you. If I'm right I think the dealer will probably capitulate and pay for it. I have a 2002 VW Passat 2.0 20-valve. When driving along I have an intermittent problem of the doorlocks activating by themselves. The best description is like when you press the key fob to unlock the doors. The interior light comes on like when you open a front door or turn the engine off and won't turn off unless I set the overhead switch to the central off position. Once this has happened pressing door open/lock from the drivers door control has no effect and will only reset and interior light also will go off after the ignition is shut off. I have driven in several modes and managed to find out when this fault occurs. It is when the drivers side mirror control is set at the defrost (central) position. It doesn't matter if the centre console defrost button is on or not. My local garage is saying I need a new Passenger Courtesy Module but this seems excessive. I haven't told them yet that I've worked out when it happens though. As were now having frost at night/morning I'm using the mirror defrost so getting frustrated with the locks activating and interior light coming on. Any thoughts/comments what I can do to try and fix this issue? My experience of older VWs and older German cars generally is that they become riddled with electrical faults. Could be that yours is nothing more then the delay switch built into the courtesy light. Could be water in the bulkhead vent well swamping electrics. Could well be moisture in the locking ands windows ECU inside the driver's door. On a new car, yes, very irritating. On a 14-year old car, unless you can fix it easily by switching off the interior light or not defrosting your door mirrors, don't worry about it. If you continue with this sort of use of the car you risk further problems. You might be able to minimise them by always using super diesel such as Shell V-Power Nitro Plus. And possibly by adding Cataclean to the tank (so far only one reader report of success with this.) Long-term you need to think petrol but, unfortunately the emphasis for the new 5-Series coming next year is diesel, not petrol, because BMW sees them as long-distance cars. Way to go maye be a small Petrol SUV such as a Suzuki Vitara S 1.4 BoosterJet 4x4, for which readers are reporting 45mpg. Or a Toyota RAV-4 2.4 hybrid. Or a Mitsubishi Outlander PHEV. 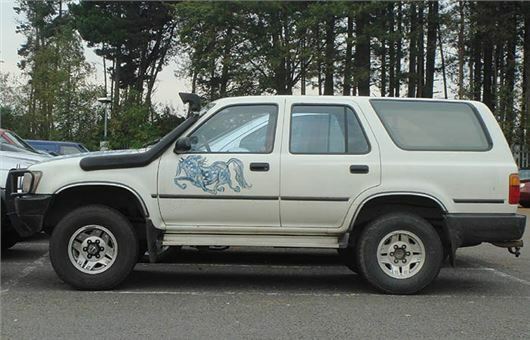 The owner of the Hilux Surf, take heart, assuming you have the 3.0 Diesel engine the cambelt is one of the easiest and quickest to change you can find (all cambelt designs should be like this), any competent garage can do this for you in around an hour at the most, a good quality, eg Gates, belt kit comprising belt, idler pulley, plus new automatic tensioner will be around £80 the lot, so the whole job should be under £150 all in. Get that chassis steam cleaned in the spring then coated in something like Bilt Hambers underbody waxes and you will still be driving that old beastie round in 20 years when almost all cars made today will be heading back hence they came in cube form, you will struggle to find an ecu anywhere on it and they were built to last and made to be serviced easily and worked on, so easy to keep them running.